I had spent the previous day in the Sierra Foothills between SR108 and SR4 but found it much warmer than I would have liked, around 88F in Angels Camp. Rather than spend a second day in similar fashion I decided to head to the higher country along SR4 where I expected cooler weather. I was not disappointed, finding overcast skies, more amenable temps in the 60s and more scenic backcountry in and around the Carson-Iceberg Wilderness. I had driven by Lake Alpine countless times in the past but never did any hiking here. The lake is part of a USFS Recreation Area which basically means high traffic. There is a paved bike path along the lake, numerous campgrounds and picnic areas, all of which seem to get heavy use during the summer season. Inspiration Point overlooks the lake on its SE side and it was to this I headed first. I used the Silver Valley TH at the northeast end of the lake as a starting point. Many of the campgrounds and picnic areas had been closed (entrances blocked by large, overturned garbage bins) for the season with signs getting the plastic wrap treatment in prepartion for the coming winter, but the TH parking was still accessible with a few other vehicles parked there when I arrived around 7:30a. The USGS and Forest Service maps both depict two trails leading to Inspiration Point though it appears that at least the eastern approaching one I tried to follow is no longer maintained. It's neither long nor difficult traveling cross-country, taking less than half an hour to reach the summit. There are rock cairns, rock art and rock initials literally all over the acre+ summit, suggesting that the location is quite popular. It has fantastic views overlooking the Carson-Iceberg Wilderness to the south and east though surprisingly poor views of Lake Alpine. About 2mi SSE of Inspiration Point is Elephant Rock. 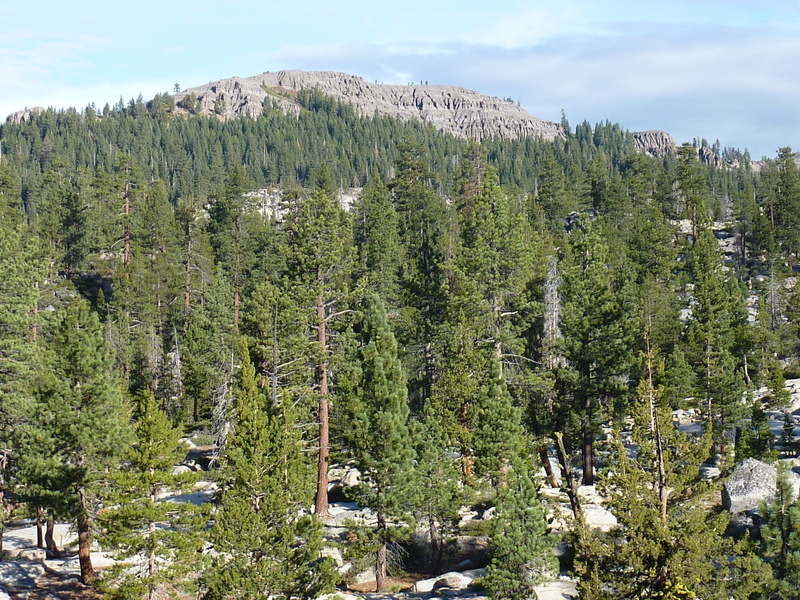 The wilderness area between the two is a mix of broken granite slabs and forest, making for a fun cross-country adventure. It's not the quickest way to reach Elephant Rock - one can drive to Elephant Lake from the west via Spicer Meadow Rd, less than half a mile from Elephant Rock. I enjoyed the route I took a great deal, the best part of the two days I was out on this trip. Not long after descending the south side of Inspiration Point I spied a gentleman sitting on a high, rocky perch overlooking the landscape. He was wearing an orange vest and spotted me at the same time, sharing a friendly wave. My guess is he was hunting, but I didn't make the detour to visit him to find out for sure. After about an hour of traveling across the various drainages between the two objectives, I finally arrived at Elephant Rock which can easily be seen from many vantage points despite its relatively low stature. It sticks up out of the forest like a modest volcanic plug. Getting to the summit is hardly obvious. I was surprised to find a use trail running along the base on the north side and followed this to where I noted a class 3 ramp I could use to gain the summit on that side. Though Elephant Rock abounds in much loose rock, the ramp route was fairly solid. The summit rocks held the remnants of several register books among the shredded pieces of a plastic bag which had been employed to protect their contents, to little success. The entries were mostly unreadable, the delicate pages no match for the weather that had battered them during their poorly protected stay at the exposed summit. Such is the ephemeral life of a summit register. Looking west, I could see Elephant Lake in the foreground, Utica and Union Reservoirs in the background surrounded by more forest and granite. To the east, clouds were thick and threatening to bring more rain to the area as they had done the previous afternoon with Bull Run and other summits I couldn't name on the horizon. Molelumne and Reba stood out as the two high points to the north across SR4. After gathering up the remains of the now useless registers I looked for an alternate route off the summit. The south side seemed fraught with cliffs while the west side might have proved viable (I didn't explore further in that direction since it was more detour than I wanted). Instead I looked for a way directly through the cliffs on the east side, finding what I judged to be a class 4 route down that side, a short but interesting bit of rock work that took me some time to decipher. Once off Elephant Rock, I went in search of the trail depicted on the maps to run just north of the feature and take me back to Lake Alpine and the Silver Valley TH. Though I had been looking for it, I did not find the trail on my way to Elephant Rock and was beginning to realize it is no longer maintained and not so easy to find. I followed along the route as indicated on the GPSr, looking for vestiges of the trail. After about 3/4mi of looking, I finally came upon some ducks marking the old route. These increased in frequency and the trail became easier to follow as I continued north towards Duck Lake. In the meadow west of the lake are the remains of three cabins that once stood here, occupied most likely while cattle were grazing the meadow. Two of the cabins have collapsed in ruin but a third still stands and looks like it might have been used up to about a decade ago when the fear of hantavirus drove us from using these old rat nests for shelter. It had two squat stories and spring beds to sleep half a dozen easily. A stove, sink and some bare cupboards completed the interior arrangements. After checking out the cabins I continued another mile back to the TH.